Each frame is .1 second apart. This performance was one of the most dominant in women's swimming events at the Atlanta Olympic Games. Krisztina Egerszegi's time of 2:07.83 was more than four seconds ahead of second place. 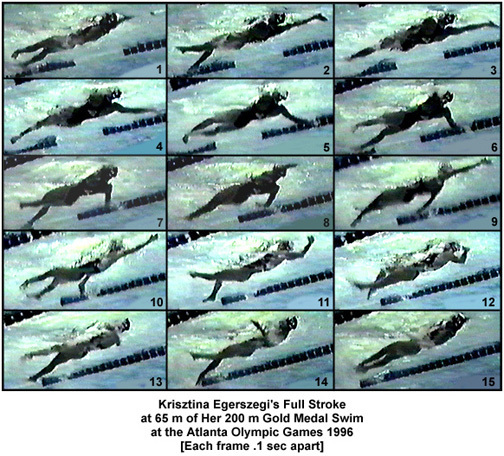 Many of the features displayed in this series of frames maintain the strengths and characteristics of the technique demonstrated in 1992 at the Barcelona Olympic Games. Frame #1: The right arm enters and the left leg kicks to counter-balance the vertical force component of the entry. The swimmer's position is noticeably streamlined. The left arm is nearing completion of its long push back. Bubbles following the left hand do not allow one to determine if the hand inward sculls or pushes back and down. Frame #2: The right arm has entered, the left leg has kicked, and the left arm is fully extended back as that arm's propulsive phase is completed. The right leg prepares to kick. Frame #3: Propulsion with the right arm begins as the right hand is rolled over, the elbow bends, and some medial rotation of the upper arm occurs. The right leg kicks which assists hip and shoulder rotation as well as counter-balancing forces created with the left arm. The left arm is stopped as it changes direction to exit the water. The fingers and thumb of the left hand can be seen to be facing the pool bottom. That means the hand movement at the end of the pull pushed to the bottom of the pool. The left shoulder is raised noticeably, a common symptom of pushing down with the hand. Frame #4: The right arm presses backward as the upper arm is adducted. It follows a slightly downward path due to further rolling of the right shoulder and because it pivots in the shoulder joint (adduction). The left arm has exited the water vigorously. The right leg completes its kick to counter-balance the vertical component of the exiting left arm. The left leg prepares to kick. Frame #5: Adduction of the upper right arm continues while further bending at the elbow is initiated. The left leg kicks to counter-balance the tendency of the bending right arm to drag the body more to the right. The right leg prepares to kick. To this stage, Krisztina Egerszegi's streamline position has been exemplary and is led by a deep firm head position. Frame #6: Right arm propulsion continues with most of the force generated by upper arm adduction. The left leg kick is completed. The right leg is lowered preparatory to kicking as the recovering left arm approaches entry. Frame #7: Adduction of the right upper arm is almost completed and extension at the elbow commences. The right hand starts downward as the lower arm rotates in the elbow joint as part of extension and partial supination. The right leg prepares to kick as the recovering left arm is close to the water. Frame #8: Propulsion with the right arm continues. Hips and shoulders rotate as the upper part of the left arm enters the water and the right leg kicks. The left leg drops down prepartory to kicking. Frame #9. The left leg kicks to assist hip roll to the left. The right arm is fully extended and low. It is set to commence extraction by sculling inward. The left arm is fully extended. The head rises slightly. Frame #10: The inward sculling movement of the right hand can be seen as the thumb leads and the hand is faced slightly backward. This will promote propulsion with the right arm to the moment it exits the water. The left arm has immediately started to bend at the elbow while the hand starts to be flexed so that it will face backward. The right leg kicks to counter-balance the left arm entry. The head is still higher than normal. Frame #11: Left arm propulsion starts very early and well in front of the swimmer: the upper arm is medially rotated, the elbow is bent, and the hand is angled slightly past vertical. The right leg kick is completed and the left leg is dropped down prepartory to kicking. The hips and shoulders continue to rotate to the left. The right arm has exited. The head is lowered deeper. Frame #12: The left leg kicks and the hips/shoulders continue to rotate. The left arm movement exhibits strong adduction of the upper arm while the hand/forearm is maintained as the propulsive surface. The hand is pitched at an angle that will contribute to hip/shoulder rotation. The right leg prepares to kick. The head has returned to its streamline depth. Frame #13: The right leg kicks vigorously as the right arm is at the peak of its recovery height. Left arm propulsion continues mainly as adduction of the upper arm. Forces created are primarily horizontal and overwhelmingly of a "drag force" character. Body streamline is maintained. The left leg is already low and positioned to kick. Frame #14: As left arm propulsion continues, medial rotation and extension at the elbow commence as adduction is nearly completed. The left leg commences to kick as it counter-balances the right arm that is nearing entry. Frame #15: A position almost similar to frame #1 is achieved and the stroke cycle recommences.